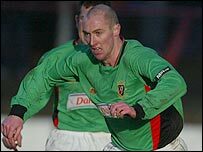 Glentoran midfielder Darren Lockhart faces a fitness race for the Big Two showdown at Windsor Park on Boxing Day. Lockhart has been out with a hamstring injury and the summit meeting may come too soon for the 32-year-old. Fellow midfielder Willo McDonagh is banned but Kyle Neill and Cullen Feeney return from suspensions. Blues striker Glenn Ferguson is set to return after missing the Co Antrim Shield semi-final defeat to Distillery in mid-week because of a head injury. The fact that the fierce rivals occupy the top two spots in the Carnegie Premier League adds extra spice to the festive clash. The unbeaten Glens hold a five-point lead over the champions after 13 games. But Linfield have a proud record to uphold - their east Belfast opponents have failed to win at Windsor Park in the annual Boxing Day showpiece for the last 16 years.